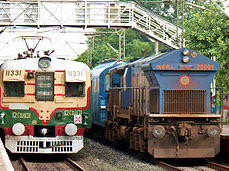 What is an Electric Locomotive Systems and their Types in India? Owing to their wide variety of advantages compared to diesel and steam locomotive systems, electric locomotive systems have become the most popular and widely used systems for traction systems. With the advent of power electronic devices, modern electric traction systems are using multilevel inverters for better traction performance like high accuracy, quick responsiveness, and higher reliability. 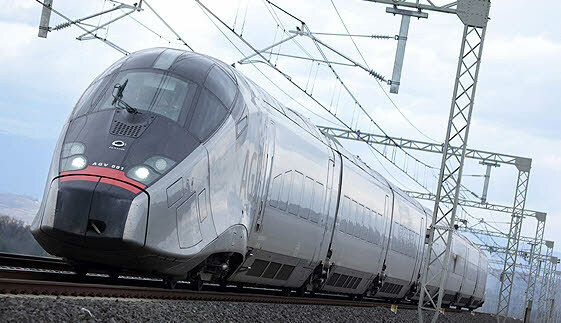 The evaluation of electric motor design and electrification technologies have not only led to the design of high-speed locomotives (Metros and suburban railways), but also have raised the overall energy efficiency. What is an Electric Traction or Locomotive? A driving force that causes propulsion of a vehicle is referred to as a traction system. The traction system is of two different types: non electric traction system and electric traction system. The traction system that doesn’t use electricity at any stage of a vehicle movement is referred to as a non-electric traction system. Such a traction system is used in steam locomotives, IC engines, and in the maglev trains (high -speed trains). The traction system that uses electricity in all stages or some stages of a vehicle movement is referred to as an electric traction system. In an electric traction system the driving force to pull a train is generated by the traction motors. The electric traction system can be broadly divided into two groups: one is self-powered and the other one is third-rail system. The self-powered systems include diesel electric drives and battery electric drives that can generate their own power to pull the train; whereas, the third-rail or overhead-wire systems use the power from an external distribution network or grids, and the examples include tramways, trolley buses and locomotives driven from overhead electric lines. The track electrification refers to the type of source supply system that is used while powering the electric locomotive systems. It can be AC or DC or a composite supply. Selecting the type of electrification depends on several factors like availability of supply, type of an application area, or on the services like urban, suburban and main line services, etc. This type of DC supply is supplied to the vehicle through two different ways: the first way is through the 3rd rail system (side running and under running electrified track and providing return path through running rails), and the second way is through the overhead line DC system. This DC is fed to the traction motor like the DC series or compound motors to drive the locomotive, as shown in the above figure. The supply systems of DC electrification include 300-500V supply for the special systems like battery systems (600-1200V) for urban railways like tramways and light metros, and the 1500-3000V for suburban and mainline services like light metros and heavy metro trains. The 3rd (conductor rail) and 4th rail systems operate at low voltages (600-1200V) and high currents, whereas the overhead rail systems use high voltages (1500-3000V) and low currents. An electric motor speed controller is used by varying the voltage applied to it. The Special drive systems that are used to control these electric motors include tap changer, thyristor control, chopper control and micro processor control drives. The disadvantages of this system include difficulty in interruption of currents at high voltages when fault condition is raised, and the need for locating DC substations between short distances. The supply systems of AC electrification include single, three phase, and composite systems. The Single phase systems consist of 11 to 15 KV supply at 16.7Hz, and 25Hz to facilitate variable speed to AC commutation motors. It uses step down transformer and frequency converters to convert from the high voltages and fixed industrial frequency. The above figure shows AC electric locomotive operation wherein the catenary system receives single-phase power from the overhead system. The supply is stepped up by the transformer, and then converted to DC by a rectifier. 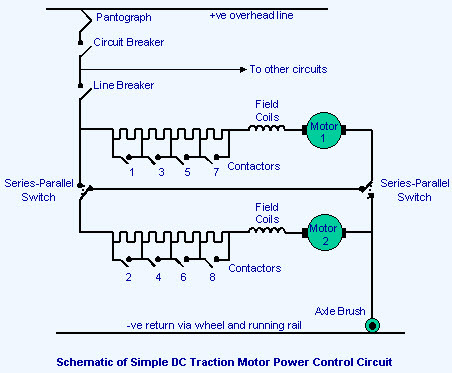 A smoothening reactor or a DC link, filters and smoothens DC to reduce the ripples, and then the DC is converted to AC by an inverter that varies frequency to get variable speed of the traction motor (similar to VFD). This system incorporates the advantages of both DC and AC systems. These systems are of mainly two types: a single phase to three phases or Kando system, and the other single phase to DC system. In a Kando system, a single overhead line carries the single-phase supply of 16KV, 50Hz. This high voltage is stepped down and converted to three-phase supply of same frequency in the locomotive itself through the transformer and converters. This three-phase supply is further supplied to the three-phase induction motor that drives the locomotive. Since the two-overhead line system of the three-phase system is replaced by a single overhead line by this system, it is economical. As we have already discussed in the AC electrification that a single-phase to DC system is highly popular, it is the most economical way of single overhead line and has wide variety of DC series motor characteristics. In this particular system, a single-phase 25KV, 50Hz supply of overhead line system is stepped down by transformer inside the locomotive, and then converted to DC by rectifiers. The DC is fed to the DC-drive system to drive the series motor and to control its speed and braking systems. This is all about the electric locomotive systems. And, we hope that we have given you ample and relevant information about the various supply systems used in the traction systems. We encourage you to write your suggestions, comments, and feedback about this article or project ideas in the comment section given below, and also expect your suggestions to reduce the short circuits accidents in the traction systems. Next › Topmost Query in Networking for Beginners- What is Ethernet?